Fluorescein angiography (FA) has played a major role in understanding the natural history of neovascular age-related macular degeneration (AMD).1 FA characterization of the neovascular lesion was essential for treatment with photodynamic therapy.2,3 With the advent of optical coherence tomography (OCT) and anti-VEGF drugs, the role of FA for clinical care has changed. OCT-determined retinal thickness measurements have served as important endpoints in clinical trials.4-6 However, time domain OCT images cannot provide information parallel to FA such as lesion morphology which has implications for treatment response. Many clinical trials rely on FA characterization for both eligibility and endpoints. Figure 1: Classic CNV (red ): early leakage with intense progression in late phase. Occult CNV (green ): ill-defined early-mid phase leakage and less intense leakage. A neovascular lesion complex can be differentiated on FA into choroidal neovascular membrane (CNV) and non-CNV components. CNV is further categorized based on the time of leakage appearance and its intensity (Figure 1). Classic CNV appears as well demarcated areas with early hyperfluorescence and intense late leakage. Occult CNV is ill-defined, appears in the early mid phase and leaks less intensely. Angiographic sub typing of CNV is based on the predominance of these two categories in a neovascular lesion complex; predominantly classic (>50% of the CNV consists of classic CNV), minimally classic (1-50% of the CNV consists of classic CNV) and occult with no classic (entirely occult CNV). Angiographic sub-typing may be an integral part of eligibility for some studies. Non-CNV components obscure the borders of the CNV and interfere with the ability to judge the borders and extent of the CNV (Figure 2). These include thick blood, elevated blocked fluorescence, fibrosis and serous pigment epithelial detachments (PED). Fibrous disciform scars, atrophic scars and tears of the retinal pigment epithelium (RPE) are also considered non-CNV lesion components. Many clinical trial protocols exclude subjects with lesions that are not >50% CNV. Another common exclusion is any non-CNV component directly under the fovea, such as fibrosis, atrophy, or serous PED. Figure 2: Non-CNV components: contiguous blocked fluorescence. Note that the CNV does not appear to be under the center of the fovea (asterisk) , which may render this lesion ineligible for studies that require subfoveal CNV. There are two important efficacy measurements derived from FA for clinical trials. Total lesion area includes the area of the CNV and each of the non-CNV components, and is measured from early - mid frames of the FA. Total leakage area is measured from late phase images (Figure 3). These measurements by themselves characterize the neovascular lesion complex objectively. A small CNV area with a large leakage area indicates a possible active classic lesion. Leakage area that is less than the total lesion area indicates a possible atrophic CNV. Figure 3: Total lesion area consists of CNV area (white) and non-CNV components(red). Leakage area (green) is measured from late phase images. FA is the gold standard for describing the lesion morphology in neovascular AMD. Clinical trial eligibility often relies upon the participating clinicians' interpretation of FA in terms of angiographic sub-typing, identification of non-CNV components and their location relative to the center of the macula, and total lesion area. Reference(s): 1. Macular Photocoagulation Study Group. 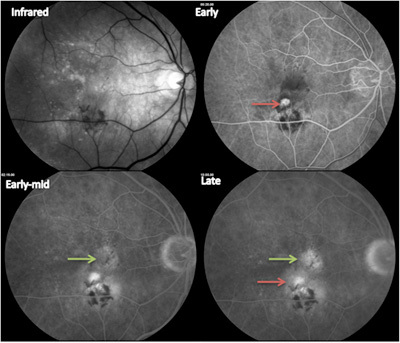 Subfoveal neovascular lesions in age-related macular degeneration. Guidelines for evaluation and treatment in the macular photocoagulation study. Arch Ophthalmol 1991;109:1242-57. 2. Verteporfin Roundtable 2000 and 2001 Participants, Treatment of Age-related Aacular Degeneration with Photodynamic Therapy (TAP) Study Group principal investigators; Verteporfin in Photodynamic Therapy (VIP) Study Group principal investigators. Guidelines for using verteporfin (visudyne) in photodynamic therapy to treat choroidal neovascularization due to age-related macular degeneration and other causes. Retina 2002;22:6-18. 3. Bressler NM, Treatment of Age-Related Macular Degeneration with Photodynamic Therapy (TAP) Study Group. 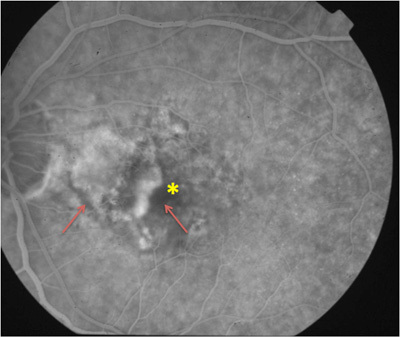 Photodynamic therapy of subfoveal choroidal neovascularization in age-related macular degeneration with verteporfin: two-year results of 2 randomized clinical trials--TAP report 2. Arch Ophthalmol 2001;119:198-207. 4. Fung AE, Lalwani GA, Rosenfeld PJ, et al. An optical coherence tomography-guided, variable dosing regimen with intravitreal ranibizumab (Lucentis) for neovascular age-related macular degeneration. Am J Ophthalmol 2007;143:566-83. 5. Kaiser PK, Blodi BA, Shapiro H, Acharya NR. 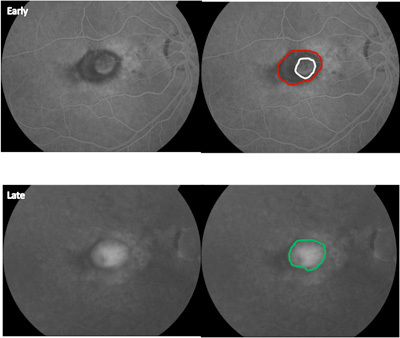 Angiographic and optical coherence tomographic results of the MARINA study of ranibizumab in neovascular age-related macular degeneration. Ophthalmology 2007;114:1868-75. 6. Goff MJ, Johnson RN, McDonald HR, Ai E, Jumper JM, Fu A. Intravitreal bevacizumab for previously treated choroidal neovascularization from age-related macular degeneration. Retina 2007;27:432-8.